Developed by Failbetter Games. Published by Failbetter Games. Released Feb. 6, 2015. Available on PC and Mac. Review copy provided by Publisher. Your latest voyage into the Unterzee has taken a bleak turn. While your ship was victorious in many battles with pirates, you're far from Fallen London and fuel is running low. You've been visiting foreign ports to resupply, but don't have enough coin to afford the outrageous price for a return trip. In desperation, you order the crew to throw food supplies into the engine, hoping you can hold off starvation until you reach land. You cannot. As hunger pangs set it, you have two options: Try and kill a nearby shark that looks like it could bite your ship in two, or size up crew members for meals. You are feeling more confident about the second option. 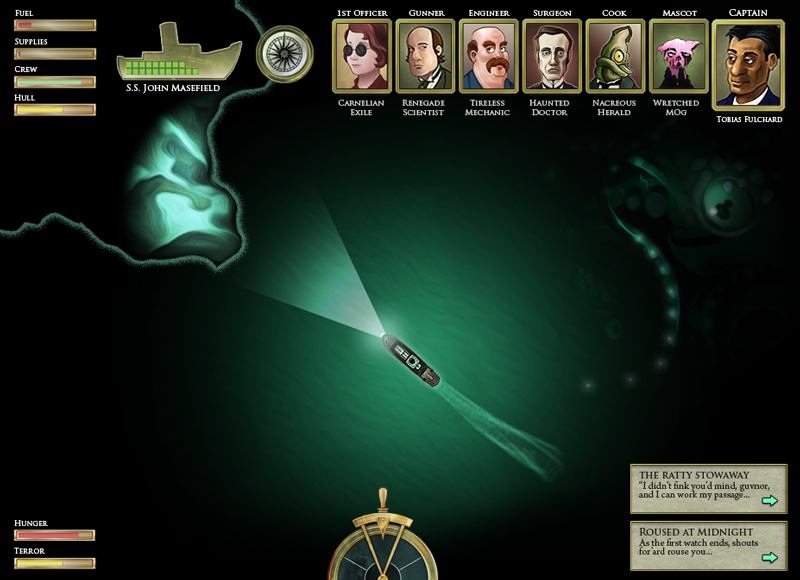 Sunless Sea is the official Kickstarted spin-off to Failbetter Games' Fallen London (formerly known as Echo Bazaar, our "Best Browser-Based Game" of 2009). In this world, supernatural forces dragged London underground during Queen Victoria's reign, trapping it within a subterranean ocean called the "Unterzee". 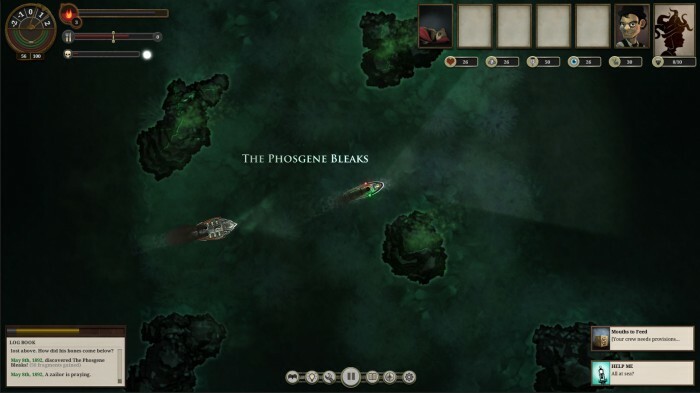 But where Fallen London was a choose-your-own-adventure game set mostly in the lost city, Sunless Sea is a roguelike exploration game about the captains sailing these deadly zees. Few crew members will survive these voyages. Starting from a port in Fallen London, the player crafts a captain backstory and quest to provide context to your adventures. Perhaps you're a military veteran seeking fame and fortune. Or you could be a poet driven by a spirit of exploration. It's even possible to be a former street urchin who gained control of a ship and now tracks the bones of your long-lost father. You can ignore the backstory elements if you'd like, but they're a great way to provide context to anyone unfamiliar with the world. Not to mention, each story allows players to pick their own victory conditions, starting down a custom story path. 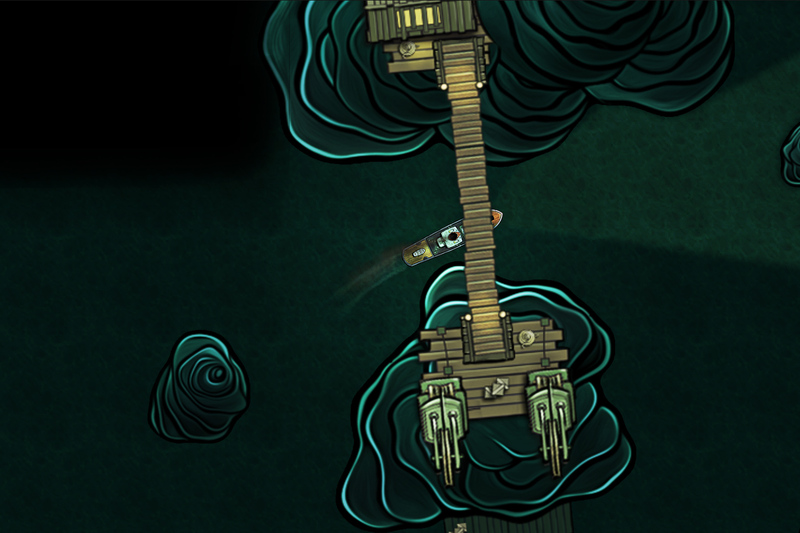 From there, Sunless Sea becomes a brutally challenging roguelike explorer game. Outside of fixed territories like Fallen London, most Unterzee map tiles are randomly assembled for each captain's playthrough, so you never know what to expect for each voyage. Players will journey across the zees, fight monsters and pirates, manage food supplies to keep the crew alive, and preserve fuel to keep moving in the darkness. There's a genuine sense of dread lingering through the entire experience, and not just because of the Lovecraftian locales and creatures. Just wait until food gets low and you need to decide between eating crew members or fighting a mutiny. Or you're stranded at sea and someone proposes a sacrifice for safe passage. It's so immersive, you'll feel like kissing the ground every time you return to London... and curse like a sailor when you set sail again. But that's only half of the game. 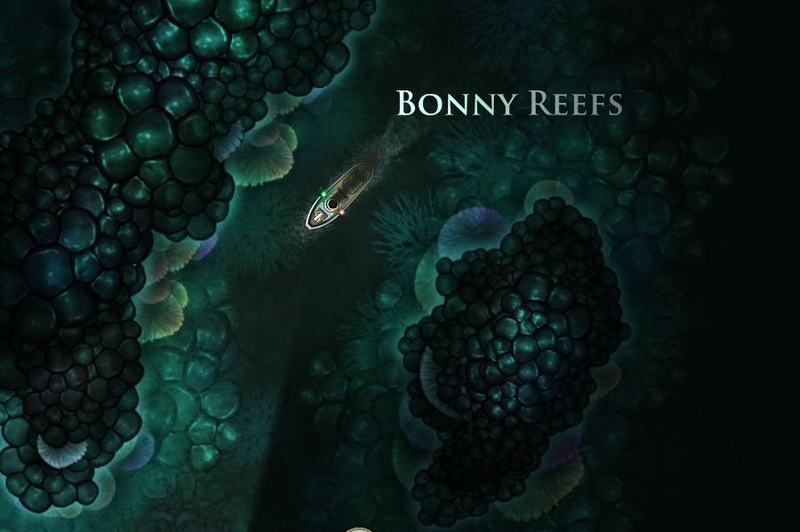 Unlike other roguelikes, Sunless Sea puts a heavy emphasis on procedural roleplaying and storytelling. Every port you enter has the potential to unlock further adventures on the low zees: You can gather intelligence reports for Fallen London, explore ancient ruins and foreign lands, pursue romantic relationships among your crew, and more. Some ports even kick off major story arcs - my favorite so far being the civil war between anthropomorphic rats and gerbils. The system bears a strong resemblance to the text-based mechanics of Fallen London, allowing for a wealth of story content without hogging your computer's resources. The downside is that almost all game content - from the tutorial to major plot points - are delivered by huge walls of text. It's still cleverly written, but you have to pay a lot more attention to avoid missing details that aren't apparent in the mechanics. Combine that with the challenging roguelike gameplay, and Sunless Sea won't feel very welcoming to casual or first-time players. That said, anyone who likes visual novels or classic adventure games will love this design, and patient captains should be able to figure out its nuances eventually. Another concern is that Sunless Sea's exploration and storytelling mechanics don't quite fit together as we'd hoped. They're not terrible by any means - Failbetter Games has developed some fascinating systems to play with. But the game keeps flipping back and forth between its steampunk version of FTL and a comprehensive visual novel, and the experience can be jarring. You'll spend one moment pushing through the murky blackness, terrified that you don't have enough food for the trip back to London. Then you dock with a port, and you're ripped from the comfortable control scheme to read about adventures with NPC locals. While each experience is well-realized and engaging, it sometimes gives the impression that you're playing two games simultaneously instead of a cohesive whole. Much like any roguelike game, you'll fail more often than you win. Perhaps you'll misjudge a battle with a monster, or maybe that drunken passenger will throw vital supplies overboard. Sunless Sea's difficulty can either be a pro or a con depending on your perspective, but since it's intentionally aiming for Lovecraftian horror I'd say it succeeded. That said, there are still mechanical quirks I wish had been tightened up - for example, why would I receive quests for cargo deliveries to regions that haven't been discovered on the map? You might end up exploring for hours to track down the location, and if the cargo is illegal, heading home to resupply carries risk. 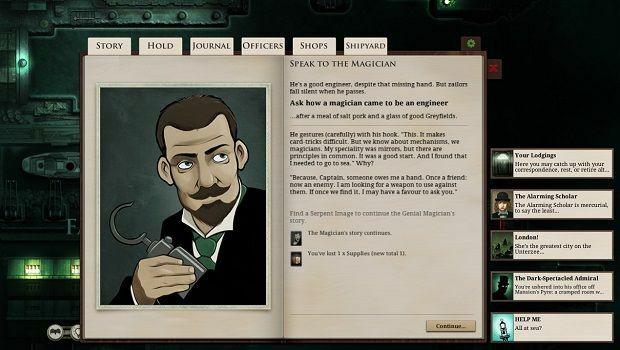 Being able to uncover rumors about key locations would be a better alternative than explaining why you're the only captain in Fallen London without a map. 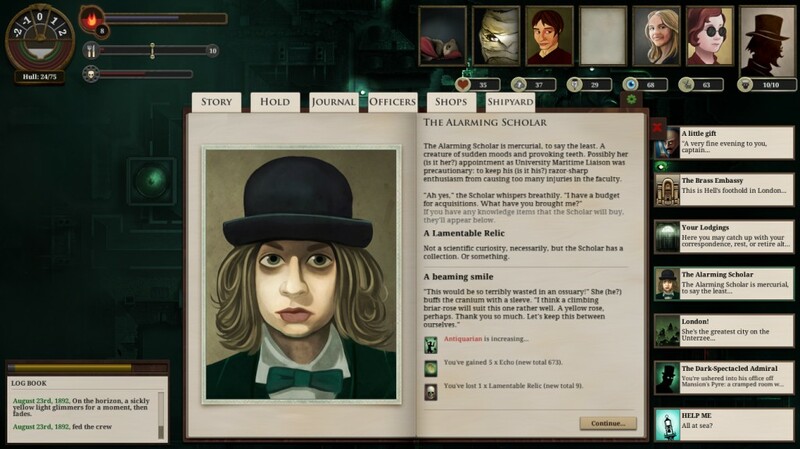 Either way, Sunless Sea is an incredibly unique game - just like Fallen London, few developers are making anything quite like it. For that novelty alone it's well worth your time, even with its flaws, no matter how insane you become during the journey. 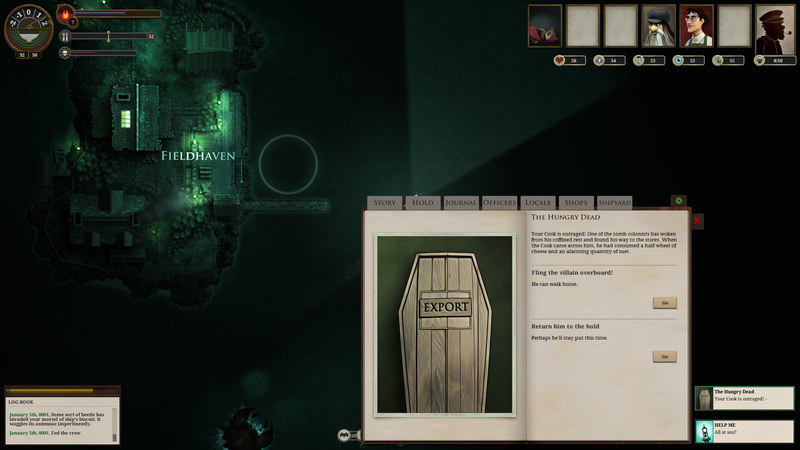 Bottom Line: Sunless Sea is a dark game combining Lovecraft-themed exploration with Victorian Gothic visual novels in exciting (and chilling) ways. The end result isn't perfect, but its sense of terror and wonder makes it a worthy follow-up to Failbetter's Fallen London. Recommendation: The first officer tastes great with a side of bat. Oh, the game? Yeah, it's good too.